"This is a delicious light & fluffy cookie with a hint of lemon in the frosting. The ricotta cheese gives them a heavenly texture." These are good cookies. The lemon flavor is really good. The flavor kind of reminds me of Fruit Loops. 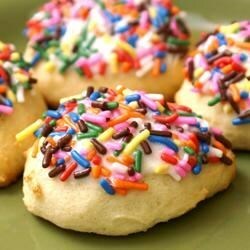 Delicious, light, fluffy cookies! My friends and family loved these! These were incredible!! They literally disappeared when I served them. I will be making these for the holidays. Thanks for a great recipe. Another WINNER! My kids couldn't stop eating these! My daughter even did the glaze and sprinkles. Light, delicate and best with the glaze since the cookie isn't real sweet.